Quality Network Appliance Provider, or QNAP for short have released a revolutionary NAS storage product called the TVS-871T that is capable of transferring and storing data at astonishing speeds on up to 3 devices simultaneously, whilst also being expandable to up to 6 of these units. It is then able to hold a combined total of an incredible 448TB of data thanks to Thunderbolt 2 Daisy Chaining. With its exceptionally low price compared to other products already on the market you wont have to blow your budget to be able to transfer and utilise large files and video. Options available are the TVS-871T with Intel Core i5-4590S 3.0GHz quad-core processor and 16GB RAM, built-in dual 10GbE ports or the TVS-871T with Intel Core i7-4790S 3.2GHz quad-core processor and 16GB RAM, built-in Dual 10GbE ports model and dual Thunderbolt 2. The QNAP TVS-871T boasts as being the world’s first Thunderbolt 2 Network attached storage device. 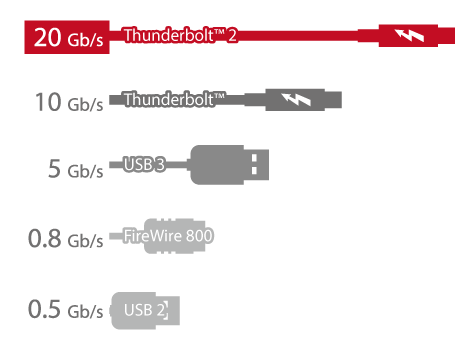 This means it has up to 2x faster transfer speeds than the previous Thunderbolt at 20 GB/s compared to the previous 10 GB/s. In addition the QNAP integrates all DAS, NAS and iSCSI storage and transfer devices to ensure the QNAP is compatible though El Capitan 10.11 is required. The QNAP TVS-871T makes the need for a SME to upgrade to a 10 GB/s Network a less daunting and expensive task as the QNAP is a brilliant cost effective alternative. The QNAP is essential for those who regularly have to upload and transfer incredibly large files such as video footage and or program files onto multiple storage devices and computers and allowing multiple users to collaborate in a way only those with 10GB/s network infrastructure could before. – Scale-up the storage with QNAP Thunderbolt 2 TX-500P / TX-800P , 5 or 8 bay expansion units, daisy chaining, your choice of hard drives. To summarise the QNAP TVS-871T has revolutionized the world of transfer/storage by increasing its efficiently in terms of speed, compatibility and multi-functionality especially for the Smaller business where expensive network infrastructure can be prohibitive to business. In any scenario where you require two or three users to collaborate effectively in production of high end video content this is almost certainly the device for you. It is also expandable beyond the base 3 users we discuss above by simply adding a 10GB/s network switch and outputting from that to extra users (Thunderbolt to 10GB/s ethernet adaptors make this possible even for Mac users). HardSoft Computers are a certified Apple Reseller with over 25 years in experience specialising in leasing computers. For more information or if you require any assistance you can contact our friendly Leasing Sales Team who are more than happy to help via sales@hardsoft.co.uk. We are a supplier of a multitude of Network Storage solutions from Drobo, Promise, Seagate and even simple desktop storage solutions so no matter what your business requirements are, we will almost certainly have the right product for you.